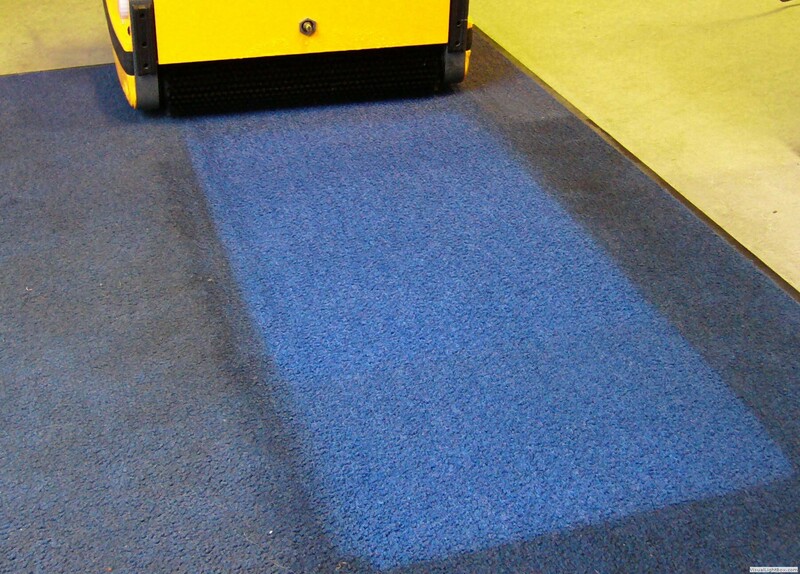 Cleaning carpets in domestic or commercial application can be made difficult by the incorrect choice of equipment. Poor results and OH&S issue are common such as Musculoskeletal Disorders (MSDs) which affect the body's muscles, joints, tendons, ligaments, bones and nerves. We also see increased operating costs due to over use of chemicals to compensate for poor equipment performance and design. This is the start of a cycle where chemicals are left behind in the carpet fibres, and as those chemical dry and become tacky they attract dirt even quicker. Stains often quickly re-appear and the carpets need to be cleaned sooner, and so the cycle continues. Rotowash: It's not what it does, but HOW it does that makes it so effective and easy to use. 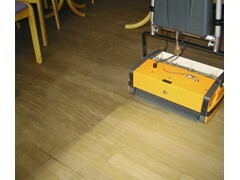 Cleaning Carpets with a Rotowash Floor cleaner is as simple and quick as using an up-right vacuum cleaner: Fill the clean water tank and start the machine, press the button to dispensing liquid evenly and just glide the rotowash cleaning brushes over the carpet for results that are sure to impress. Lower the operating handle and press the button to dispense the liquid onto the carpets across the full width of the brushes. Your Rotowash will glide with ease over the carpet for a professional and instant Scrub, Wash and Dry. The spot removal information below contain the methods for dealing with accidental spillages and the order in which the treatments should be tried. DIFFICULT SPOTS chart are more difficult to remove and may require repeated attempts with stronger spot removers. Some stains you may find impossible to remove completely in which case the assistance of a professional carpet cleaner may be required. 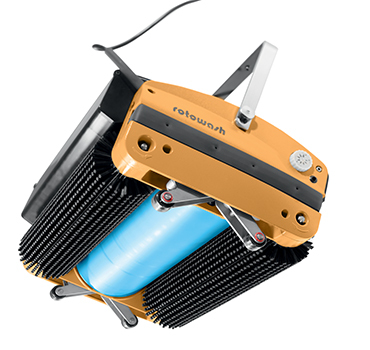 Rotowash floor scrubber is ideal for cleaning all types of hard floors. Our unique orginal designed brush system adapts to the contours and profiles of each floors, and can moved from hard floors to carpets without the need for stopping. 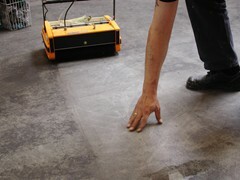 No longer does cleaning tiled floors, stone or concrete have to be a painstaking, back breaking job for poor results. Such outcomes commonly result from operators simply using the wrong equipment. How often do we see cleaners attempting to clean floor tiles with a mop & bucket, where experience has taught us that after a while with mopping; we see a residual film of dirt and fat and chemical build up on these sufraces, as the mopping just spread the dirt around. 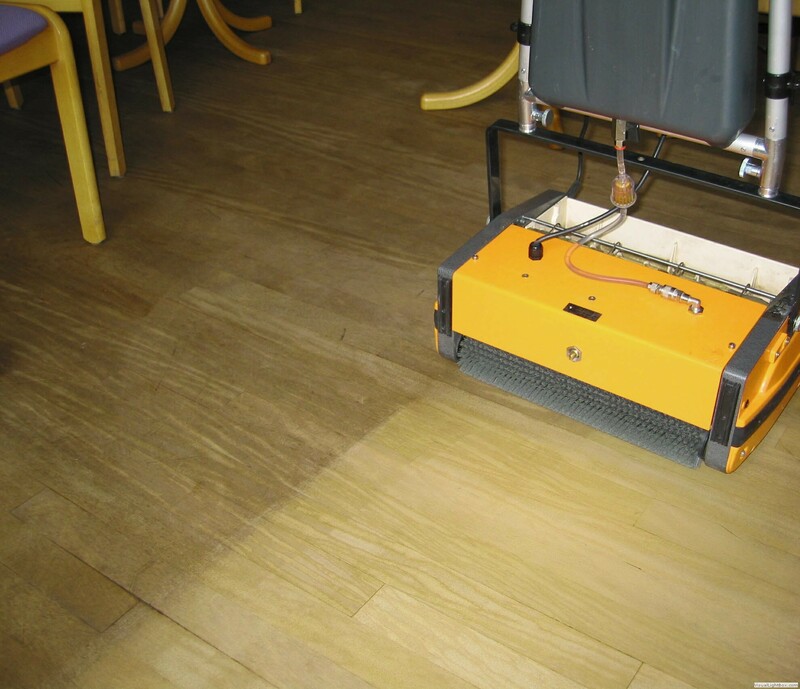 This leaves your tiles looking dull and the grout lines filthy. Cleaning hard surfaces with a Rotowash Floor cleaner is quick and easy. Once the surfaces have been restored they are easy to maintain with just water. Rotowash has been working globally with Flotex distributors for over 20 years. Flotex has approximately 10 times more fibres per square metre than carpet; 70 million fibres per square metre. Flotex fibres and backing are impervious (not allowing fluid to pass through the backing over into the fibres), waterproof, rot proof, crush proof and a high wear resistance which is why it is so popular in commercial facilities like hospitals, nursing homes, schools, sporting area's and shops. Be aware that normal vacuum cleaners will not operate effectively on Flotex as they are not able to create sufficiently airflow through the flotex fibres because of the density of fibers and the sealed water proof backing. For regular everyday cleaning with a vacuum cleaner its recommended that a motorised brush head type be used. 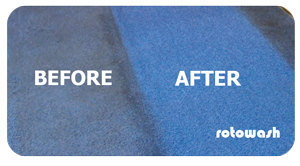 No fuss, o mess; To scrub, wash & dry a Flotex carpet with a Rotowash is quick and easy. - If you clean regularly with a rotowash most stains and soling can just be removed with plain water and aggitation. This is because of of our uniquely designed twin contra rotating brush action and waste fluid collection without the need of a vacuum motor and suction. The quick and easy way to see if there is detergent build in in your Flotex floor coverings is to carry out a simple 'Suds Test' by pouring a glass of water onto stains or soiled area's and scrub with a hard bristle hand brush. 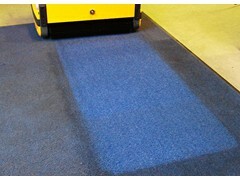 Scrap the suds to one side to reveal bright clean carpet. 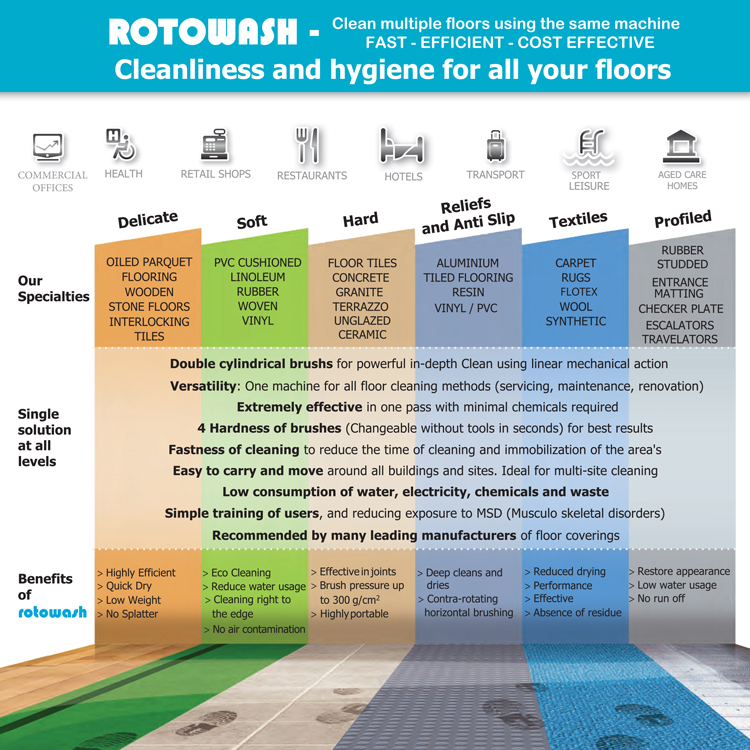 If foamy suds appear then we recommend that you contact us to arrange a FREE onsite rotowash demonstration, where one of our professional team will be pleased to show you the benefits of a rotowash, and how you can reduce your cleaning time and costs. Regupol has been supplying the sporting, education, retail, commercial and construction industry with the Regupol® recycled rubber flooring and acoustic underlay for many years. But some of the profiles of this type of rubber surface are not easy to mop and you can see at times dirt and water getting trapped on the uneven surfaces. A Rotowash is the ideal machine for restoring and maintaining the presentation of these quality floor coverings. 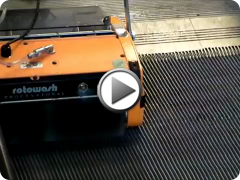 The rotowash specialist machine model R45BEscalator & R60B Escalator achieve a high quality deep clean on escalator treads and travelators. In one pass the R45B & R60B Escalator scrubs, washes, and collects the dirt, retrieves the water immediately, and dries. The R45Esc & R60Esc have all the features of the R45B and R60B, and by using a special brush with stepped bristles, these machines may be adapted for all travelator- cleaning applications as well. This product is ideal for the many miles of escalator/travelators (moving walkways) that are used in airports and supermarkets around the world. 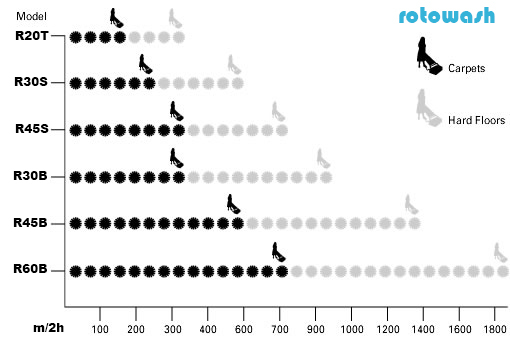 A typical escalator can be quickly and easily cleaned in a matter 15 - 20 minutes. The operator simply stands with ease holding the machine in position with the escalator/travelator moving towards the machine . The washing and scrubbing action of our twin contra rotating brushes, with 600,000 bristles, rotating at 650 rpm dislodges the dirt and removes it efficiently, leaving the walkway clean and dry almost immediately. Please also note that our product is specifically designed not to damage the aluminium treads or present any safety hazard to electrical component. Our training programme is designed to ensure that you will gain the maximum benefit from using your Rotowash R60 series machine. 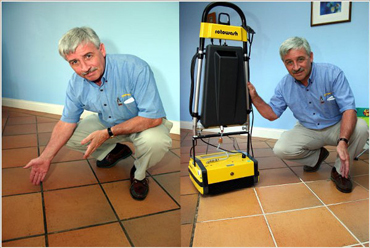 Additionally, in a matter of seconds the R45Besc & R60Besc can be switched to standard floor cleaning mode. 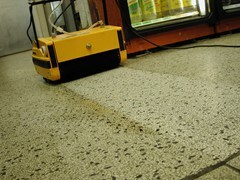 Thats the beauty of our design, one machine to clean all surfaces; even escalators and travelator. Now thats real effeciency. 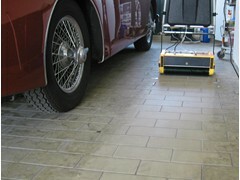 A rotowash is perfect for reaching deep into the profiled uneven surfaces of anti-slip flooring and entrance matting. 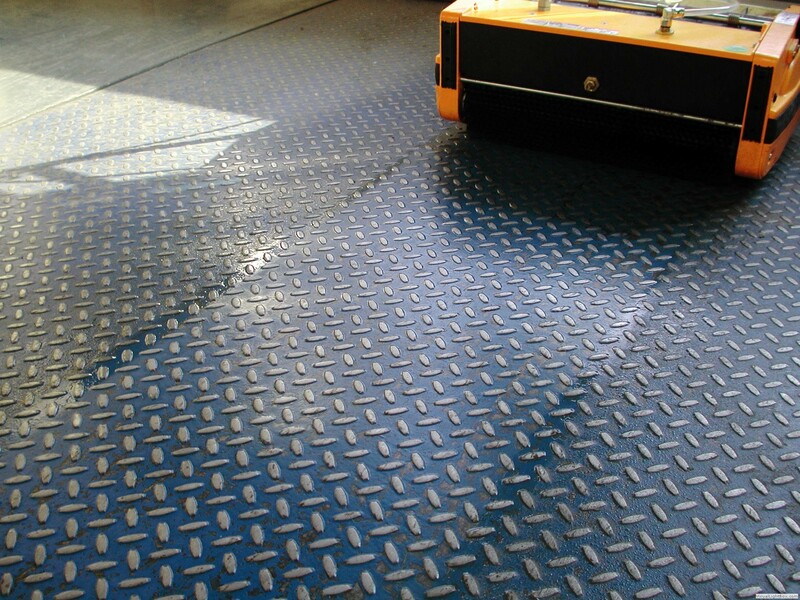 Anti-slip surfaces are now common place in most commercial and public area's to reduce slips and falls. But this can be a big problem for cleaners due to the wrong type of equipment being provided. It's very important to always remember that these are safety floors, and if not cleaned correctly then the build up of soiling overtime can contribute to slips and falls. 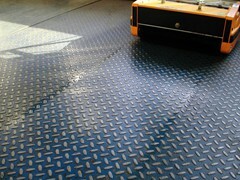 Cleaning these types of safety surfaces with a rotowash floor cleaner is quick and easy. NO fuss - No mess. 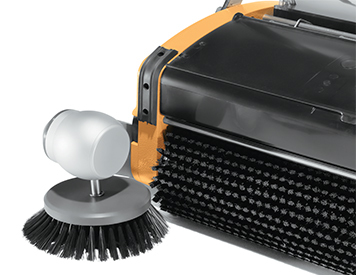 Our twin contra-rotating brushes with over 600,000 bristles will extract the dirt and ensure that your cleaned floors maintain maximum traction.